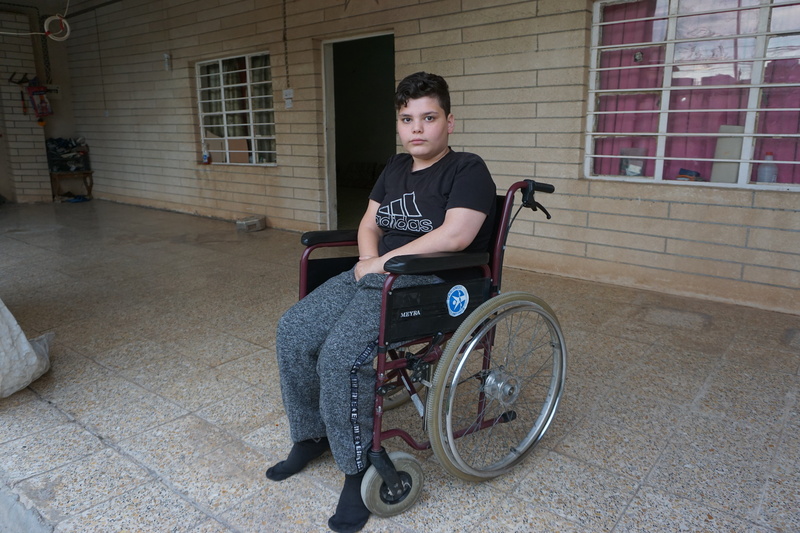 Alian is a 13-year-old Yazidi boy from Bashiqa, a town located around 30km north-east of Mosul. He used to have a normal life living in a house with his parents and 4 siblings and attending school. When ISIS fighters started to take over the Ninawa plains, his family was forced to leave. Initially they stayed in an incomplete building and then they rented a very modest house consisting of 2 rooms. Alian’s father managed to find a job as a taxi driver. Their life was slowly getting back to normal. However, 2 years ago, Alian started to suffer from an increasing muscle weakness, first in his lower limbs and later also in his upper ones. As he was gradually losing the ability to walk, he even had to leave school. His family was seeking medical help and Alian underwent many investigations, but none of them were able to find the cause of Alian’s disease. Finally, he was diagnosed with muscular atrophy and specalists suggested that he should start physiotherapy. Despite Alian’s father having a regular income, it was very difficult for this displaced family to pay for the physiotherapy sessions 3 times per week, pay the rent of their house and, in the meanwhile, try to rebuild their destroyed house in liberated Bashiqa. Fortunately, thanks to a donation from the French Association for the Aid of Youths with Disabilities and People with Handicaps (Association pour l’Aide aux Jeunes Infirmes et aux Personnes handicapées), we started to partially support Alian. With regular physiotherapy, his condition is slowly improving.